Where there’s smoke, there is hot air; and that means there is Al Sharpton. The only thing Sharpton hates more than white people is paying taxes. And talk about cleverly avoiding them. 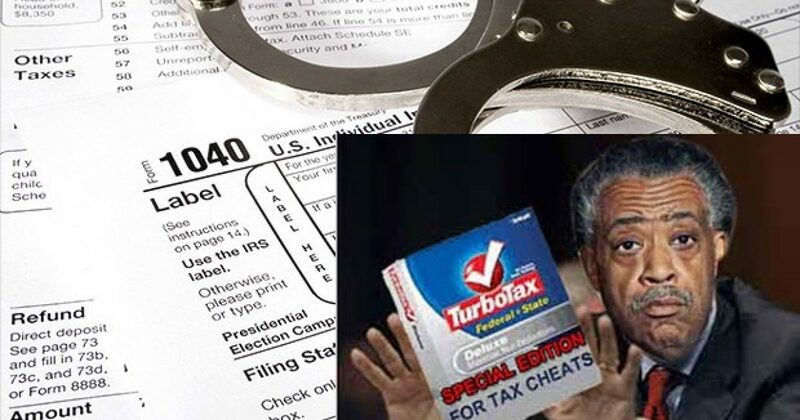 Here is video of Sharpton fighting for other to pay their taxes! As Al Sharpton ran for mayor of New York City in 1997 and for president in 2003, fires at his offices reportedly destroyed critical financial records, and he subsequently failed to comply with tax and campaign filing requirements. The first fire began in the early hours of April 10, 1997, in a hair-and-nail salon one floor below Sharpton’s campaign headquarters at 70 West 125th Street. From the start, investigators deemed the fire “suspicious” because of “a heavy volume of fire on arrival” and because many of the doors remained unlocked after hours, according to the New York Fire Department’s fire-and-incident report. As the fire crept upward into Sharpton’s headquarters, it destroyed nearly everything, including computers, files, and campaign records, the Reverend’s spokesperson at the time told Newsday, adding that “we have lost our entire Manhattan operation.” But a source knowledgeable about the investigation tells National Review Online that Sharpton’s office was mostly empty, and that the damage was not extensive.